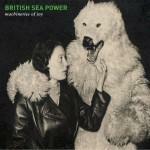 It may have been a full ten years since British Sea Power’s splendid debut struck a blow for outsider rock, but the band is certainly not showing any signs of slowing down. Machineries of Joy is BSP album number five – or six, depending on how you class 2009’s Man of Aran soundtrack – and it sees the Cumbrian exiles embracing their maturity and demonstrating restraint, without scrimping on the songs. There’s a casual feel to the record, which represents a departure from the freneticism of the band’s early work. It’s not as subdued as the minimalist Man of Aran, but the soothing repetitions of that soundtrack have clearly left their mark. The title track combines warm synth sounds and a motorik beat with Noble’s glacial guitar line to quite spectacular effect. The ingredients aren’t much to shout about on their own, but their effortless fusion amounts to six of the most satisfying minutes of music to emerge in 2013. After such a grand opener, it’s perhaps inevitable that K Hole comes across as a relative disappointment. While the band is perfectly capable of crafting rousing rockers, Yan comes across as a most unlikely narrator in this tale of chemical overindulgence. I’m not immune to irony, but I don’t quite understand the band’s reason for killing the buzz immediately after one of its strongest compositions. Hail Holy Queen and the beautiful, string-drenched What You Need The Most restore the balance, while Loving Animals will likely raise smiles and eyebrows in equal measure. Monsters of Sunderland kicks off the album’s second half with one of its few genuine surprises – a horn section. The effect is initially jarring, the horns seemingly out of place on a British Sea Power record, but as the song progresses, its marriage of horns and spiky guitars gels to create one of Machineries’ clear highlights. While none of the remaining four tracks scales these heights, only the sluggish Radio Goddard is an out and out misfire. Just a few weeks after label mates The Strokes (Rough Trade releases both bands’ music in the UK) released a disjointed mess of a fifth album, British Sea Power has delivered a focused and compelling reminder of its continuing relevance. The BSP discography is starting to resemble a How-To Guide for young bands striving to make a career out of music without compromising artistically. Here’s to the next chapter.